Some would say that a game where one player is literally Hitler is in decidedly bad taste. I’m not one of them. But even if I was, arguing about taste with Max Temkin, one of the minds behind Cards Against Humanity, seems like a losing proposition. And I don’t imagine Mike Boxleitner and Tommy Maranges, the other two designers of Secret Hitler, are more open to the concept. And with the title, you know a lot about the game already. One of the players is Hitler, but which one is a secret. 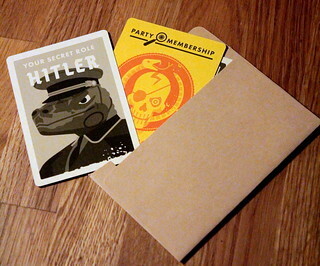 Secret Hitler is a hidden identity game in the style of Werewolves and The Resistance. Most of the players are Liberals. Their goal is to prevent Hitler’s rise to power, but they have no idea who anyone in the game is. A smaller group of players are the Fascists who want to help Hitler into power. They know each other, and in consequence they also know who the Liberals are. And Hitler is one special, fascist snowflake. His death or election end the game. With five or six players he knows his fascist co-conspirator, with seven or more players the other Fascists know who Hitler is, but Hitler doesn’t know who his Fascists are. Secret Hitler is fairly simple to play, as usual for this type of game. Every round starts with the President. This office rotates around the table. The President chooses a Chancellor with whom he enters the elections. All players simply vote Yes or No, if the Yes votes have a majority the new government is elected and starts its work. Without that majority the President plaque passes on and everything starts over. If that happens too often then bad things happen, but lets assume for now that a government is elected. This government gets to enact one policy, either Liberal or Fascist and this is where the other players may glimpse some information what side the government officials are on. 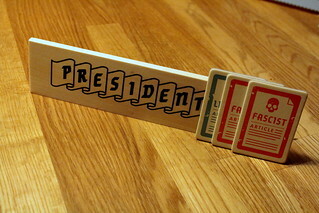 The President draws three policy tiles. One of them he discards without showing anyone else what it is, the other two he passes on to the Chancellor. The Chancellor again discards one policy, the remaining one is enacted. If that enacted policy is Liberal then nothing more happens. All the players rejoice, the Liberals sincerely and the Fascists through clenched teeth, and the game continues. However, if the policy was Fascist the President may now get a special power to use once, right then. What power that is depends on the number of players and the current round, but they include useful things like spying on another player’s faction card, or selecting the next President instead of passing the office to the next player. Towards the end of the game the presidential power is always the same: the President may have someone shot, and if that turns out to be Hitler the Liberals win the game. That sounds like the Liberals should have a reasonably easy time to figure out who is who, but two things get in the way of that. First, there are more Fascist policy tiles than Liberal ones, so it’s not unusual for a Liberal government to have no choice but to enact an Fascist policy. Since they cannot show the discarded tiles to the other players, and they are allowed to lie about what tiles they got, convincing the other players that that is what happened might not be easy. Enacted policies are not shuffled back into the stack, so this is more likely to happen the more success the Liberals had before. Even more tricky are the Presidential powers. They only work with Fascist policies, but they are just as useful to the Liberals, possibly more so. It’s tempting for a Liberal President to enact just that one Fascist policy because it would really help them keep the country safe from those Fascists. 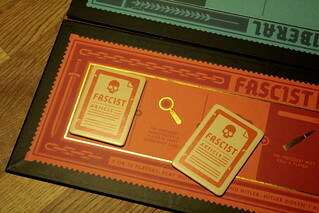 That actually makes Secret Hitler depressingly realistic, if you think about it. That’s how the players get some irritatingly unreliable information about everyone else, and with that they are supposed to keep Fascism at bay. Or not, as the case may be for some of them. The game ends when Fascism is either defeated or successful. One way for the Liberals to win we already saw: killing Hitler is never a bad thing. They also win if they enact five Liberal policies during the game, but that’s almost all the tiles there are, so that happened rarely when we played. The Fascists win if they enact six Fascist policies, but they also have an earlier win condition. After three Fascist policies have been enacted the Fascists win immediately when Hitler is elected Chancellor. That second one makes the game very tense for the Liberals once Fascism has found a foothold. Any election where they are not certain the Chancellor is one of their own might mean defeat – and certainty is hard to get. That’s what I like about Secret Hitler, you get tension and uncertainty, and both are things you really want in a hidden identity game. The Fascists are annoyingly certain about who is who, but their numeric minority still makes the outcome of anything uncertain for them. You gain some certainty as the game progresses. You can’t trust what other players tell you, but since you know how many tiles of each kind are in the Policy deck you can keep track if everything they say is plausible, at least. If too many people tell you that they had no Liberal policy to pick, then you know one of them was a lying Fascist. I really like this mechanism for dispensing information as it adds some structure to the social deduction of the game, different from other hidden identity games where all you have are players’ unstructured decisions. I also like that the varying presidential powers, as well as the sudden death victory conditions for both sides, vary the stakes every round and keep Secret Hitler from feeling like you’re doing the same thing every round. And while there is player elimination, normally one of the big nopes for me in a game, shooting other players can only happen near the end of the game so they won’t have to wait more than a few minutes before they can join the next round. You get all the fun of other hidden identity games, but with a bit more structure, something I often miss in this genre. Secret Hitler is a new favorite of its kind, and it has a good chance to keep that title for a while. I would recommend, however, to play with at least seven people. Hitler not knowing his team adds something to the game, and this whole genre is strictly “the more, the merrier” anyway. P.S. : This might be relevant for our German readers: despite the games theme it doesn’t show swastikas or other symbols that would put it at risk of being forbidden in Germany.